Special | Poem 1 | This poem is available only by making a donation to december magazine. Marvin Bell is an American poet and teacher and the first Poet Laureate of Iowa. He is the author of more than 20 books of poetry, the recipient of Guggenheim and National Endowment for the Arts Fellowships, and Fulbright appointments to Australia and Yugoslavia. Bell edited and published the literary magazine statements from 1959 until 1964, was an associate editor of december, and was poetry editor of The Iowa Review. For 40 years, he taught for the Iowa Writers’ Workshop, retiring as the Flannery O’Connor Professor of Letters. He currently serves on teh faculty of Pacific Univsersity’s MFA program. He lives in Iowa City, Iowa, and Port Townsend, Washington. 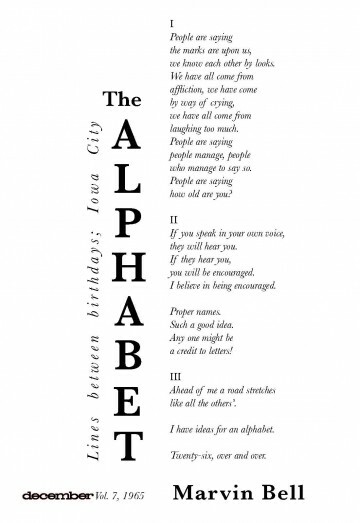 “The Alphabet” first appeared in december Volume 7 in 1965. Since this is a classic from december‘s archives, I wanted to use one of the classic bookmaking typefaces. I chose Baskerville because I like how its roman and italic forms work together. As I played with the layout, the line “Ahead of me a road stretches” was something I kept coming back to and the idea of a road complemented the vertical nature of the body of the poem, so I arranged the white space between the body, title, poet’s name and citation to suggest an intersection, with the long stretch of one avenue pointing upward.